To perform arbitrary-precision arithmetic in C and C++ programs on Windows, I use GMP. In particular, I use MPIR, a Windows port of GMP. MPIR is a simple alternative to using GMP under Cygwin or MinGW. I will show you how to install MPIR in Microsoft Visual C++ as a static, 32-bit library. I will also show you how to install the optional C++ interface — also as a static, 32-bit library. I will provide two example C programs that call the GMP integer and floating-point functions, and two equivalent C++ programs — programs that use the same GMP functions, only indirectly through the C++ interface. Microsoft Visual C++ (I use Visual C++ 2008 Express Edition). A file archiver (I use 7-Zip). The MPIR source code and Visual C++ solution (I use mpir-1.3.1.tar.gz, which is based on GMP version 4.2.1). The Yasm assembler (I use yasm-0.8.0-win32.exe). From mpir-1.3.1.tar.gz, use your file archiver to extract mpir-1.3.1.tar; from mpir-1.3.1.tar, extract folder mpir-1.3.1. Copy \mpir-1.3.1\build.vc9\yasm.rules to the Visual C++ project defaults directory (mine is C:\Program Files\Microsoft Visual Studio 9.0\VC\VCProjectDefaults\). Rename file yasm-0.8.0-win32.exe to yasm.exe. Move yasm.exe to the Visual C++ binary directory (mine is C:\Program Files\Microsoft Visual Studio 9.0\VC\bin\). Open the MPIR Visual C++ solution \mpir-1.3.1\build.vc9\mpir.sln. The project consists entirely of configurations that require support for platforms which are not installed on this machine. The project cannot be loaded. Right click on “Solution ‘mpir’ (14 projects)”, select “Properties” and then click on “Configuration Properties” and then click on “Configuration Manager”. In the box labeled “Active solution configuration” select “Release” and then click “Close” and then click “OK”. 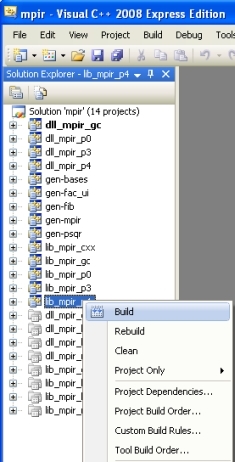 Build the version of the library you want by right clicking on the project name and selecting “Build” (I built lib_mpir_p4, labeled in the readme file as the “MPIR library using Pentium IV assembler”). Optional: for C++ interface only: Build the C++ interface by right clicking on project lib_mpir_cxx and selecting “Build” (again, ignore the compiler warning messages). C:\Program Files\Microsoft Visual Studio 9.0\VC\lib\. C:\Program Files\Microsoft Visual Studio 9.0\VC\include\. Open an existing Visual C++ solution or create a new one. 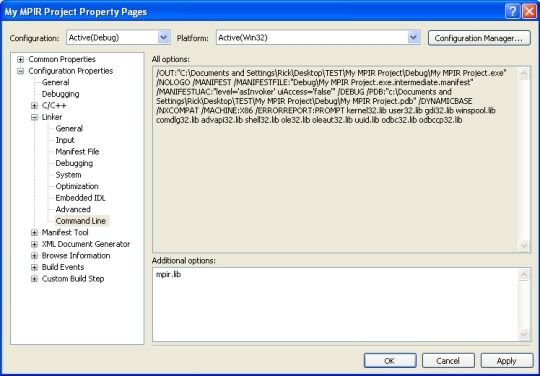 Right click on the project name and select “Properties”. Then click “Configuration Properties”, then click “Linker”, and then click “Command Line”. In the “Additional options” box, enter “mpir.lib” and click OK. The MPIR GMP functions are documented in the MPIR manual, which is essentially the same document as the GMP manual. (I verified this with PARI/GP). The MPIR GMP C++ interface is documented in the MPIR manual (and the GMP manual). The value of 1343 to setprecision is the precision in decimal digits. Besides the much cleaner syntax of the C++ programs, the underlying GMP functions — “*_init”, “*_clear”, “*_mul”, etc. — are hidden in the C++ classes. This article is my distillation of the MPIR readme file for a specific build scenario — please refer to \mpir-1.3.1\build.vc9\readme.txt for details on other builds. Thanks to Brian Gladman for answering my questions and for suggesting I explore the C++ interface. Selecting this led to several error messages when building, so I let this as was and have this warning. Not a problem. I assume you are using an existing project? I guess the project depends on its existing setting for this. In any case, if the warning caused you no problem, then I guess all is well! It sounds like you missed a step: either you didn’t copy mpir.lib (and mpir.pdb) to the right place (step 4) or you forgot to add mpir.lib to your linker command line (step 5). So, for me, with Debug configuration it doesn't work with default setting or /MT but it works with /MTd. My instructions say to use “Multi-threaded (/MT)” because lib_mpir_p4 is built that way if you set it to “Release” in step 3. Are you using the debug configuration in the MPIR build? Then yes, “Multi-threaded Debug (/MTd)” is the right choice. May be its important: I have AMD64 and build lib_mpir_k8. Then from folder “x64” copy mpir.lib and mpir.pdb to “visual studio 2008\VC\lib” , …. Are you using Visual Studio 2008 instead of Visual Studio Express 2008 (that would be the only way you could build lib_mpir_k8 — it’s a 64-bit project)? In any case, I think you should be copying from /lib_mpir_k8 and not /x64. According to your output, you are trying to build the debug configuaration for win32 but Rick’s description applies to win32 and release. When you build MPIR for debug use you need to select ‘win32’ and ‘debug’ in the configuaration manager and then select the multi-threaded debug library in the compiler property dialogue. As Rick says, if you are using a win32 application you should not use the lib_mpir_k8 since this is an x64 library. The lib_mpir_p4 library should work on an AMD64 system operating in win32 mode. I built lim_mpir_p4 and now my mpir programms work sometimes. Namely when a changing properties of project. I think it is effect of my old broken windows or VC or smth like that. When I said what I copy from “x64” I meant “lib_mpir_k8\x64\Release”. Thank Rick, Brian very much! Goodfellow — glad I could help! One quick question, using a .NET console app I can successfully use the C lib, but it will not compile if I use the c++ interface. Both, compile and run fine using win32. It seems there is a conflict with certain function in System namespace already defined: eg. PS (take it easy on me, I am not a C++ or C programmer at all) However, the current libgmp wrapper I use in C#/VB is way to slow because of the unmanaged interop. You did miss a step, which goes between your step 2 and 3. Before you build your platform-specific project, you first have to build project GEN-MPIR. This project generates the header files that are required to build the platform-specific projects. Thanks! This is exactly what I need and it works! what you described works, but do you know, how I can convert a mpz to a normal string? I need it for example to set the text of a label. The function “mpz_get_str()” is probably what you are looking for (see the GMP documentation I linked to above for details). Well, I saw the function “mpz_get_str()” in the documantation before, but it returns a char. I don’t know how to use or convert the function to get a normal string. What do I have to write to convert a mpz to a string I can use to set the text? Convert op to a string of digits in base base. The base argument may vary from 2 to 62 or from −2 to −36. In my example, I printed the string, but you can assign it to your “label” field. thanks for the fast answer … you really helped me. The problem was to convert a Standard C++ Library String () (which I get from the function) to a System::String of the .NET Framework (which I have to use for the text of the label). I’m glad you solved your problem. Now I know how to get a string from a mpz. Can you give me a short example how to get one from a mpf. but I don’t know which parameters I have to pass and how (mainly I don’t know what is meant with mp_exp_t and n_digits). I would be very happy when you could give me a short example like you did with the mpf. This was very helpful. The string returned by mpf_get_str() is just the digits after the radix point (not including leading 0s). n_digits specifies how many digits you want. *expptr is an output variable that contains the exponent — it tells you where to place the radix point. For example, say you have a variable myFloat and you set it to 0.00123456789012. If you call mpf_get_str() with n_digits = 6, the returned string will be “123457”, and the exponent will be -2. This means the string should really be “0.0123457”, but you’ll have to write code to format it that way yourself. I think I don’t use expptr correctly. Can you say me, what I make false? And how can I convert variable from the type mp_exp_t to an integer? Now I have no problems any more. I followed the directions exactly as to the placement of mpir.lib, mpir.pdb, mpirxx.lib, and mpirxx.pdb. Could you help please? If you followed the instructions exactly I don’t know what could have gone wrong. The best I can suggest is to go through it one more time, checking that everything is the same. You might also want to read through the other users’ comments and see if anything there applies to you. Please let us know if you figure it out. Thanks for the quick reply Rick. I followed the directions again, and when I built lib_mpir_cxx, in the Win32 directory it made mpir.lib and mpircxx.lib (not mpirxx.lib) so I followed the directions with those two, and it finally worked. Thanks for this page, I hate it how all the programming libraries are for linux and nobody thinks to make one for windows. Interesting. Mine is definitely mpirxx.lib. I wrote these instructions using MPIR version 1.3.1 — perhaps you’re using a different version? In any case, I’m glad it worked out. Oh, no wonder then, I grabbed the latest version off t he MPIR website, which is 2.1.1. I have folloewd the steps and then built your c++ example of mpz_class. after I built it I tried to activate the exe file but I get an error “activiation failed beacuse mpir.dll wasn’t found”. what’s the problem ? Are you sure you followed the directions exactly? They are for building a static library, not a dynamic one. Great article, it helps me so much. For those having problems, if you built a 64 bit version, you might need to set it to release and x64 before it starts working, debug does not work for me. (1 error C2059 and 20 errors C2018) If someone else knows why, I’d be delighted to know. Your debug build probably didn’t work because it was being linked with the wrong run-time library. You need to ensure that your application uses the same run-time library as that used when MPIR is built. The other possible issue is when a build is done without cleaning out an earlier build – this should be automatic but I have found that this sometimes fails. 1. Which project should I build? I have a Intel T2300 Core 2 CPU. It is Pentium M.
2. I set the /MT switch, but it did not compile. So I changed to /MD and that worked. However, it still has LNK4098 warning. How do you get rid of it? I haven’t tried MPIR on a 64-bit CPU, but you can try lib_mpir_core2 (and maybe /MT will work OK with it). Sorry for the delay but I don’t visit Rick’s site all that regularly. If you are running a 64-bit Windows system, you need the lib_mpir_core2 built for x64 and release. This uses /MT as the default so it should work. When i delete this string program works correct. Do you get the same error if you just delete the setprecision() part of that statement? In any case, I don’t know what is happening. Sorry. How do I do this for Visual C++ 6 and mpir-2.4.0? Or do I neet to get a specif version of MPIR for that?? Hi, I have the same problem as kusha. I tried several combinations of /NODEFAULTLIB:library with no result. When I change “cout << setprecision (1343) << aSmallPO2 << endl;" to "cout << setprecision (1343) << endl;" the project links ok. I don’t know if (or how) kusha resolved his problem. Maybe if you tell us more about your system and the versions you installed (if different from above) someone can help you. First of all, thanks for such a great article. However, I ran into the same problem that Dave encountered. For C version, everything works well. But for C++, I got many `unresolved symbols` problems. Have you tried to build the latest version of MPIR (2.40) in VC++2010? I personally think there are several problems to C++ version of MPIR with VC++2010 specially. Let me know if you can build it successfully. Thank you. I am still using exactly the setup I describe in this article (MPIR 1.3.1, Visual Studio 2008, etc.) (If it ain’t broke, don’t fix it 🙂 .) If I ever upgrade I’ll be sure to update my instructions. In the meantime, maybe you can find some help at mpir.org. Thanks and good luck. @Rick Regan: Thanks again for your quick response. It’s kinda odd when the build process failed only on C++. But I really don’t know how were you be able to use the same “exact” set up though. Because the mpir-2.40 that I downloaded doesn’t have the “\mpir-1.3.1\build.vc9\yasm.rules” but “vsyasm.props, vsyasm.targets, and vsyasm.xml”. Anyhow, I’m look forward to seeing your new tutorial on a newer version MPIR 2.40 ;). And of-course thanks for the link to further help. I haven’t rebuilt since I wrote this article (March 2010), so I am in fact using the versions of everything as listed. Perhaps you can get help at the mpir-devel group. Please let us know if you resolve your issue. I’m still using my old build of MPIR — perhaps you can get help at the mpir-devel group? Sorry. For those wanting to build a newer version of mpir, just go to mpir-2.5.1\win and run the two batch files in a command window. You will need to download yasm, rename and copy over yasm.exe to C:\Program Files\Microsoft Visual Studio 9.0\VC\bin. Hi, one question, would you mind telling me how to install everything but for visual 2010?. Sorry, I have not upgraded to VS 2010 yet. However, I want to be able to display the numbers in a ratio format. Any ideas? By the way, I am using 64 bit Visual Studio 2010. But I built it in Win32, and your example works fine. Sorry, I have not tried it on 64-bit. Thank you for the tutorial. All your examples work for me, except last line in floating point c++ interface: cout << setprecision (1343) << aSmallPO2 << endl; Even without setprecision is not building. I download mpir-2.2.1 as the last version supporting VS2008, and build lib_mpir_gc instead lib_mpir_p4. I build in release mode – 32bit version on XP. The error is same as kusha reported above. Do you know how to resolve this problem? Sorry, I’m still on my original build, even on my 64-bit machine. On step 4, files mpir.lib and mpir.pdb from mpir version 2.6 aren’t present, searched the entire directory tree, can get everything else to work though. I don’t know what you mean. The link in my article points to yasm-0.8.0-win32.exe. If you’re trying to build and it fails, try downloading yasm from here http://yasm.tortall.net/Download.html and download vsyasm, not yasm! It worked for me. Also check out the readme.txt at build.vc10, it might help. It’d be best if you just linked to my site instead of copying the code. It’s not that I want to protect the code per se, but my articles are copyrighted. I appreciate the interest though. Thanks for asking. Any chance of updating this for Visual Studio 10 and vsyasm @ http://yasm.tortall.net/Download.html . I had no luck trying following your instructions with these (mpir.lib just isn’tt there). Sorry, I still use this old setup. I don’t know how to set it up with the new releases. 6>operable program or batch file. 1.Open the MPIR Visual C++ solution \mpir-1.3.1\build.vc9\mpir.sln. it brought up visual c++ but required updates for all and you couldn’t ignore that. each project had 2 errors and when it was done the solution had 0 projects rather than 14. I’m sorry that I can’t help you (these build instructions are over four years old and I haven’t built a new version). Maybe you should try mpir-devel@googlegroups.com as indicated in comment #79 above. …followed step 5. – project “Properties” > “Configuration Properties” > “Linker” > “Command Line” > “Additional options” :- mpir.lib. Also did this project “Properties” > “Configuration Properties” > “C/C++” > “Code Generation” > “Runtime Library” :- “Multi-threaded (/MT)”. Sorry, I have not tried the build on newer versions. Perhaps try the MPIR Google group (see comments above).